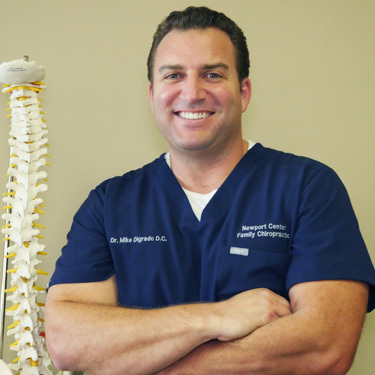 Dr. Digrado is passionate about providing Newport Beach community members with cutting-edge treatment at his chiropractic care center. At Newport Center Family Chiropractic we welcome family members of every age and from every walk of life. We cater to the needs of every patient, from children and athletes to professionals and those in their golden years. Our patients love our emphasis on gentle, low-force adjusting techniques in a caring and compassionate environment. This life-altering experience inspired Dr. Digrado to become a chiropractor himself. He attended Life Chiropractic College West, earning a Doctor of Chiropractic degree in 2001. When Dr. Digrado isn’t busy taking care of his many patients, he enjoys living an active and fulfilling lifestyle. As he was born and raised in Newport Beach, he has a special affinity for beach outings. He also enjoys going to the gym, seeing movies and hanging out with the many members of his extended family. We love families and enjoy seeing our patients living active, healthy lifestyles. Contact our friendly office today, and ask for a same-day appointment! We’re also open on Saturdays, and feature later hours for your convenience.